There were at least 2 movements of old locomotives on the main line on Monday 15 May 2018 but this one took my fancy more than a pair of class 50s running light engine. The train pictured here at Defford is a 5Z20 11.15 Ferme Park to Kidderminster SVR presumably to take locomotives and stock there for some gala or other. 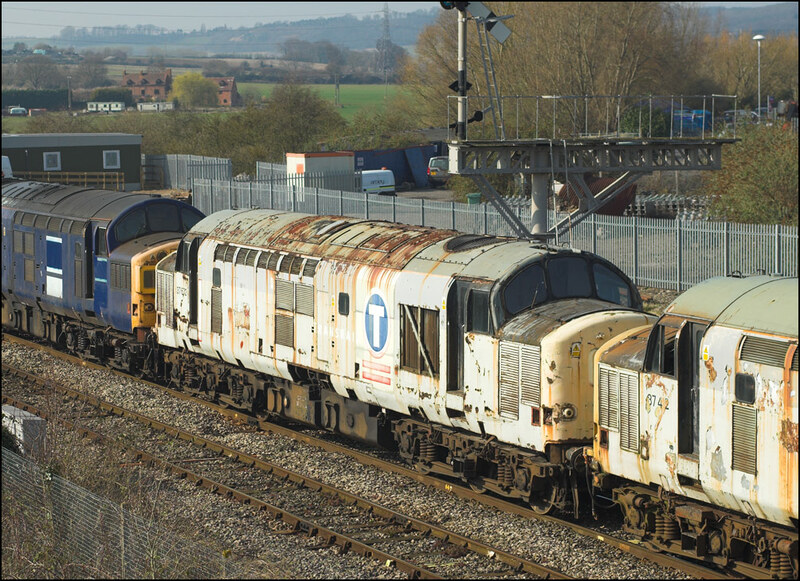 I nearly went to Dog Bridge at Norton Barracks but decided on an image from here to take advantage of the wider angle to better show 20205, 20189 and 73136 leading a 4 TC set with 20142 and 20007 bringing up the rear. 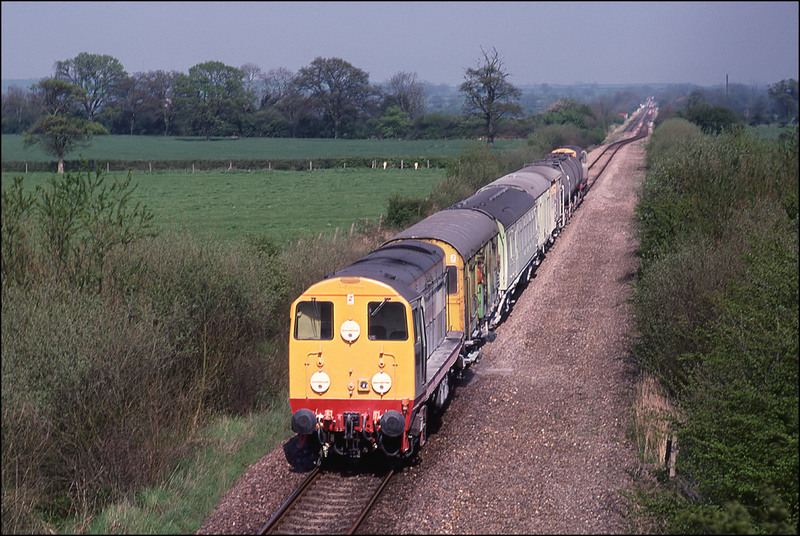 A day or two before 4 May 1989 I was given some gen about the weedkilling train with class 20s topping and tailing the consist. It was due to work to Banbury from, I think, Didcot and then run along the then freight-only line to Claydon Junction. I took a day off work and went to the road bridge adjacent to Banbury North signalbox and set up in the sun. The first shot shows the train headed by 20904 and tailed by 20901 as it arrived on the down main line with the sprayers in operation. 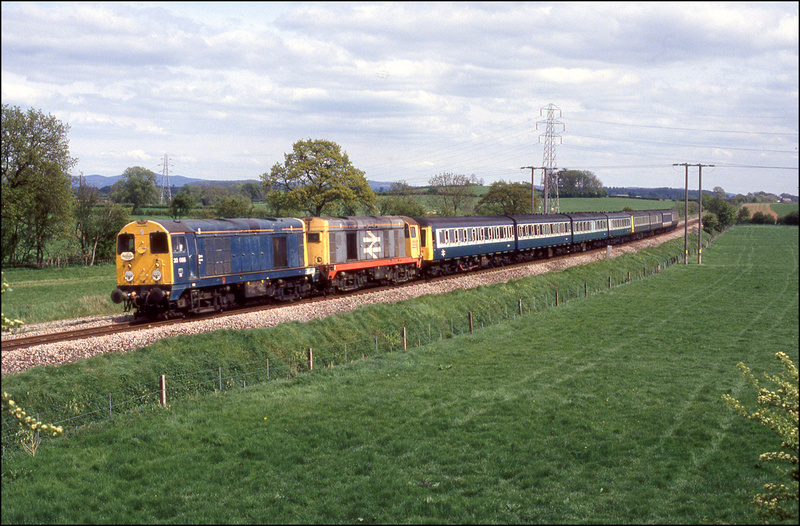 The second shot on 4 May 1989 shows the pair crossing from the down main line to the up relief. At this time the yard was still in use, mostly for the storage of withdrawn wagons and several semaphore signals remained albeit those with upper quadrant arms rather than the proper Western Region type. 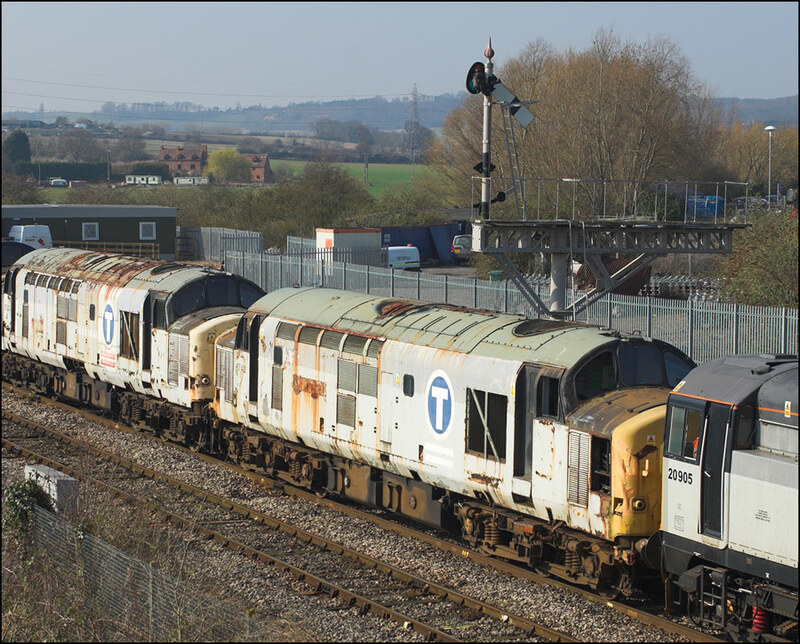 Some of the latter are in this picture of 20901 with 20905 at Evesham on 20 March 2009 while employed taking some scrap to Long Marston. My third and final shot in this short sequence at Banbury taken on 4 May 1989 shows 20901 + 20904 heading along the up main line towards the station after going north again past me on a move that I didn't photograph. The conveniently placed tree behind the train covers most of the eyesore that is a factory processing the taste out of coffee beans to make a warm brown instant drink! 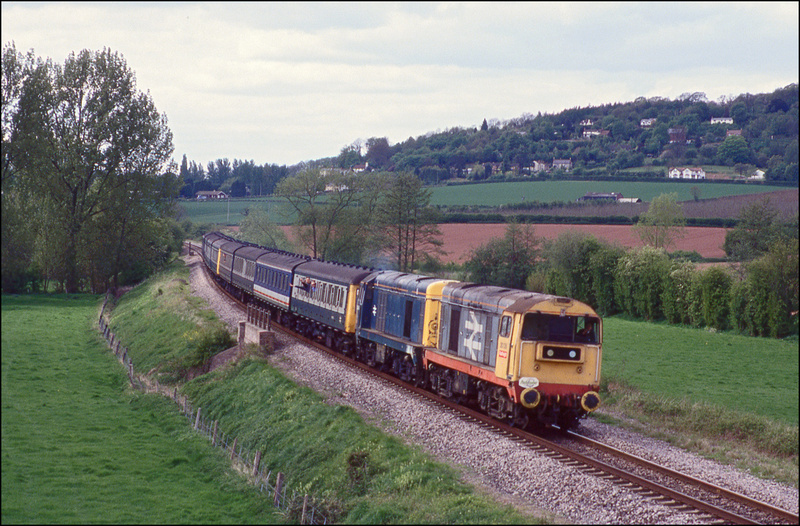 The next 4 images show a mini-railtour run by Pathfinder in connection with an open day at Worcester on 2 May 1993 using 20138+20066. The 2 locos were, unusually, hauling 2 4 car DMUs which ran from Birmingham New Street to Worcester via the Lickey incline, and then on to Hereford and back via Great Malvern. 3 out of the four shots I took of the train were in full sun, the only which was not was the return from Hereford. This caused me some amusement due to the comments from certain characters about the day being a complete waste of time as this one shot at Stoke Edith (out of 7 for the day) was not in sun. As you can see below the colour shot was still quite acceptable, at least as a record of 20s on this line.The first shot was taken as train slowed for the junction at Stoke Prior before it turned onto the single line to Droitwich and Worcester. After a quick drive down to Ashchurch with a couple of minutes to spare, the second shot presented itself. It is interesting to note that the trees on the up side of the line were still quite small in 1993. They subsequently grew very tall and last year, 2004, were felled. There was plenty of time to run over to Stoke Edith, on the Worcester - Hereford line, to obtain the next shot. The sun still co-operated for this pleasantly rural view. This was the final shot of the day - the one I mentioned above without sun which so infuriated some of the more vocal enthusiasts. It is the classic view at Stoke Edith which I expect is now so overgrown as to be unusable. Staying with railtours for the moment, this photograph shows 20090+20120 frightening the children as they make an enormous noise while storming out of Birmingham's Snow Hill tunnel as they work Hertfordshire Railtours' "The Velvet Glove" on 6 May 1991. Any loco was most unusual here at this time - this train had 3 on as 47813 was on the back having hauled the train into Snow Hill where it reversed. The weekly train moving tube stock from Amersham to Derby Adtranz, 7X10, normally runs in a path that is too early for photography south of the West Midlands conurbation much outside the longest days of the year. On Tuesday 3 December 2013 something happened and the original schedule was cancelled between Banbury and Derby with a new one going into the system with departure from Banbury scheduled at 10.42 and a passing time for Hatton of 11.17. Although not an uncommon sight in daylight to the north of Birmingham this train was certainly worth a trip to Hatton North Junction for the rarity value even on a murky day with some mist lingering amongst the trees. Departure from Banbury was 14 minutes early but 7X10 was held to time in the centre down road at Leamington Spa to allow 168108 on a Moor Street service to pass it and by the time Hatton was reached a deficit of some 7 minutes had built up. Here are 20314 + 20311 leading the barrier tank and tube stock away from Hatton station with 20096 + 20118 bringing up the rear, the front locomotives making quite a noise as they accelerated away from a yellow signal. The HNRC colour scheme shows up well on the such a dark day and adds something extra to the Autumnal scene where most of the trees still have their colourful leaves in place. An Old Dalby to Amersham tube stock move, 7X09, was scheduled to run on Monday 17 June 2013 and with the longest day not being far away I went over to Hatton to try for a shot. The train was hauled by 20901 + 20905 in GBRf livery and was running exactly on time, 20.23, as it passed Hatton station and began to accelerate down the bank towards Warwick and Leamington Spa. This is just about the most favourable spot between Hatton and Leamington Spa should the sun appear which on this occasion happened a few minutes too late. 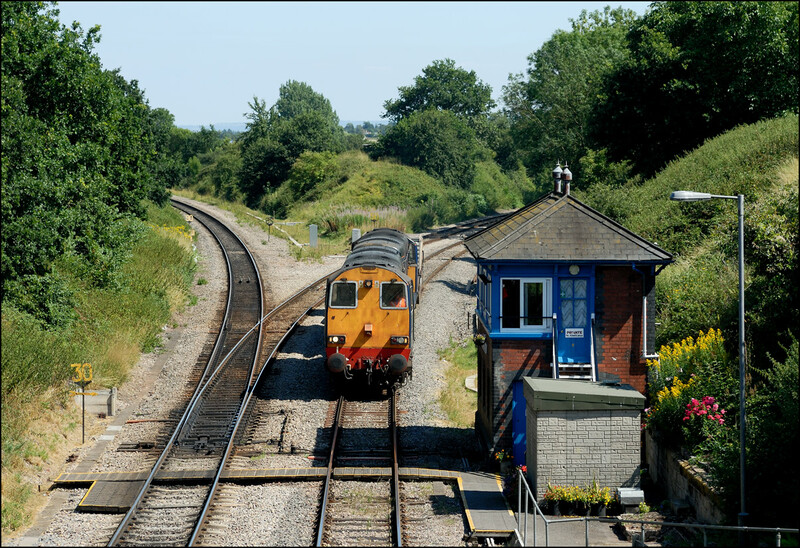 Another photograph of this pair in a previous colour scheme is shown here as they passed Evesham signalbox with some scrap metal heading towards Long Marston. 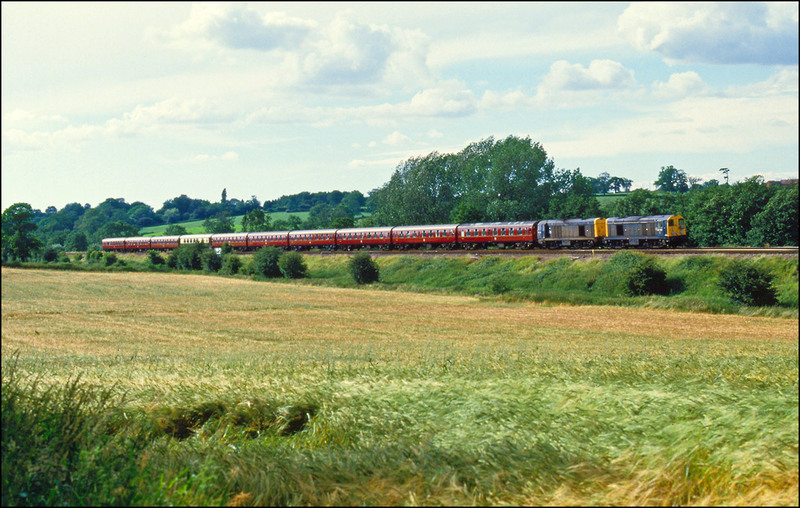 A set of new tube stock for London Underground was moved from Old Dalby to Amersham on 14 July 2010. Running as 8X09, the train left Old Dalby shortly after 11 am but, because of pathing necessities, wasn't due to pass Hatton until 20.09. My original plan had been to go somewhere north of Tamworth for a shot in the afternoon but I completely forgot about the working until it was too late. So my best bet for a photograph was either the Dorridge area or just south of Hatton station and I chose the latter thinking that Dorridge would probably be heaving with people. The train was hauled by a pair of de-branded DRS class 20s, 20304 + 20305, with another pair 20301 + 20302 dead in tow on the back and is here seen amidst the Angustifolium Epilobium, commonly known as Rosebay Willowherb, accelerating down Hatton Bank under quite a cloud of exhaust smoke a few minutes late and just catching the last dregs of light. I knew that it wouldn't be going too quickly at this point so just about got away with a shutter speed of 1.640 and an aperture setting of f2 on ISO 320. 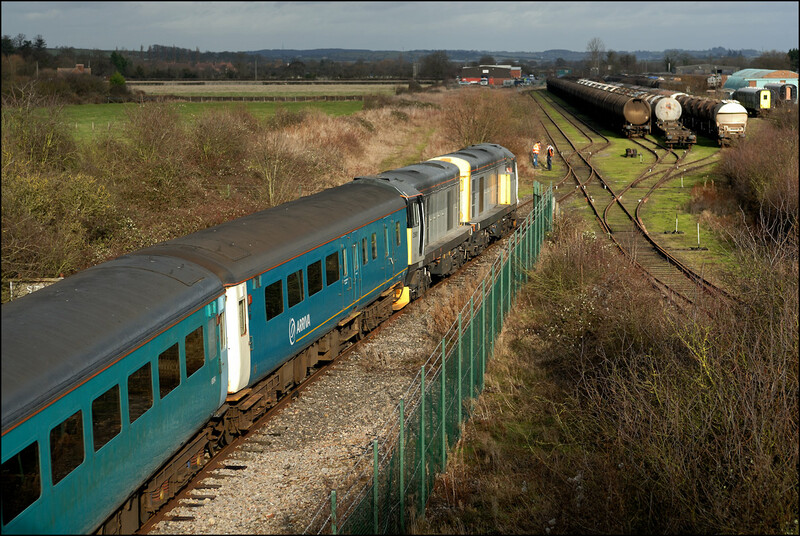 The two TEA barrier wagons came from Long Marston in February 2009 and here they are approaching Evesham at that time. 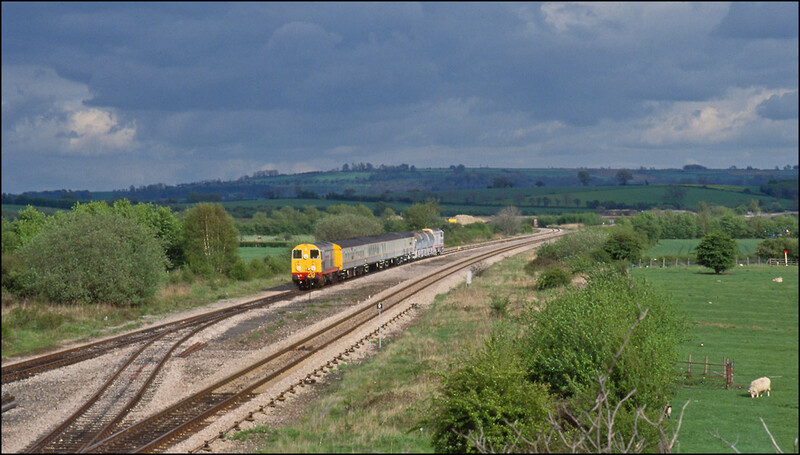 This photograph, taken on 1 May 1992 at Honeybourne Junction, does not have much technical merit, but does show a train on the former east loop. 20901+20904 have just brought the weedkilling train back from Long Marston and, when the main line is clear, will use the crossover in the foreground and then return south to Oxford. 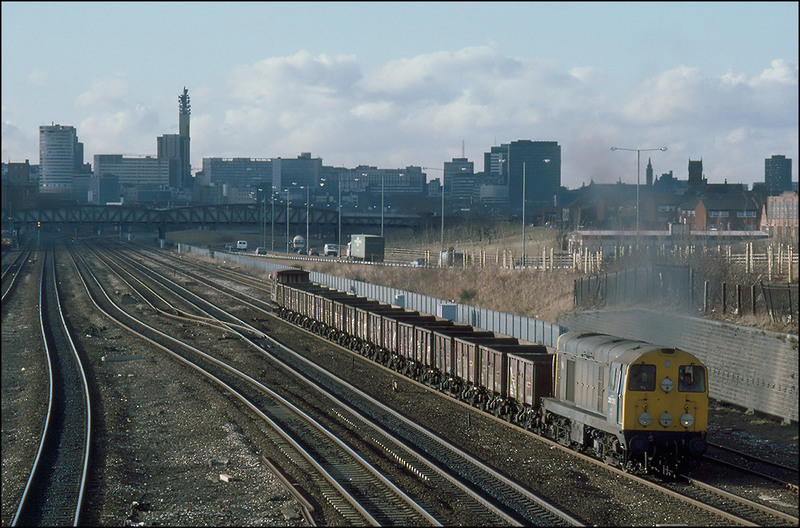 At this time the tip, just visible in the background, was still in use and saw trains of spoil from Bescot once or twice each week. The current view is largely unchanged except for the usual unchecked of lineside trees. To be fair, a much more unrestricted vista is available, but a reasonably long lens is needed. 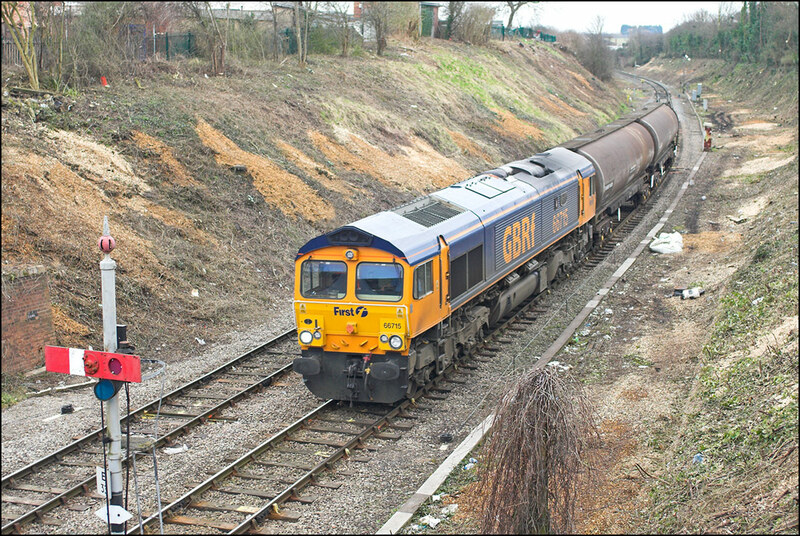 Here is a 2008 shot of a class 66 with a 73 standing in approximately the spot. It wasn't long before the line was clear and the weedkilling train was allowed access to the main Cotswold Line. It is here seen crossing over the spur where, if I remember correctly, it reversed at headed south towards Moreton-in-Marsh and Oxford. This location is set to change during 2010 when the single track here is doubled and the arrangements to allow train onto the branch are revised with the track through the former branch platforms at the station being relaid with the connection to the main line placed at the south (east) end. DRS has an occasional presence on the northern end of the south Cotswold Line in the form of nuclear flasks from Bridgwater in Somerset. Although booked to run to run this way habitual early running often means that 6M67 is diverted and goes straight up the main line, or Old Road, to Birmingham via the Lickey Incline. 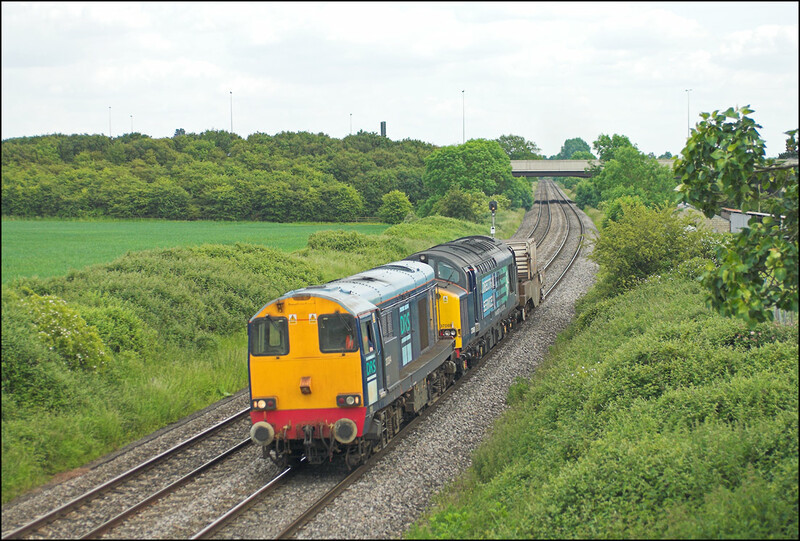 Luckily, on 4 June 2009, the booked route was taken and here are 20304 + 37069 with a single flask just after passing under the M5 motorway en-route to Worcester. Less luckily, the sun didn't cooperate and came out from behind thick clouds a couple of minutes after the train had passed by. 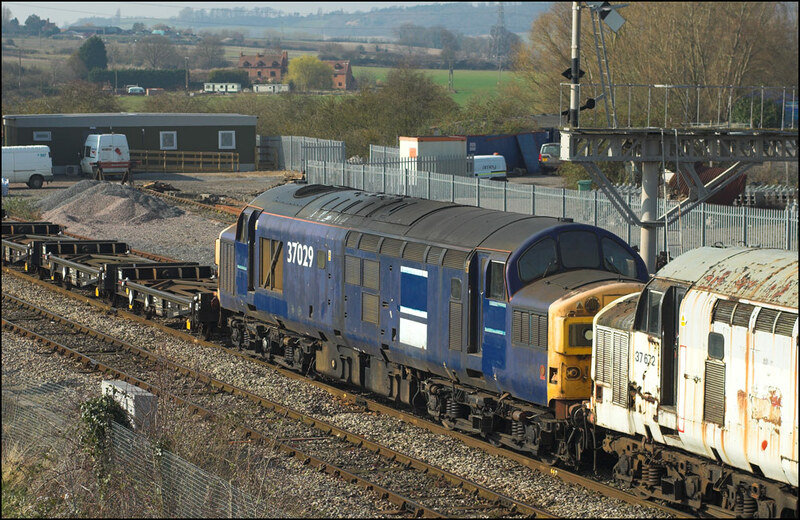 The relocation of three withdrawn class 37s from Barrow Hill to Long Marston took place on Friday 19 March 2009 with 20901 + 20905 providing the power. 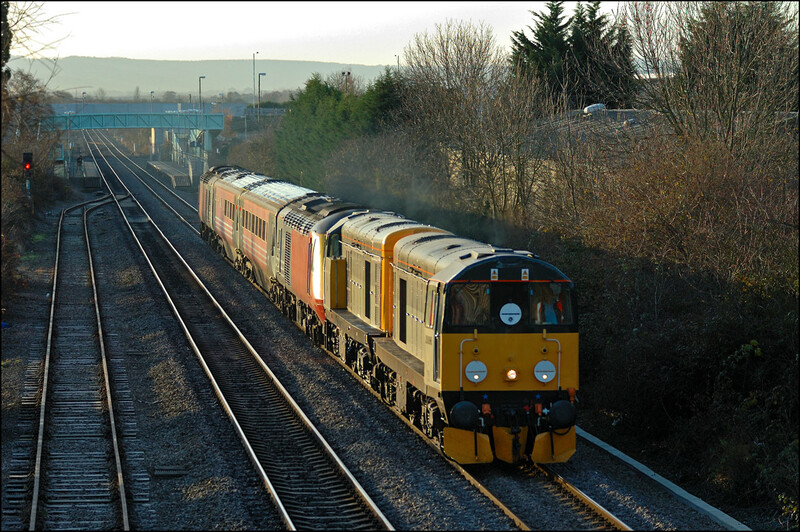 I was a bit ambivalent about photographing this move because it wasn't the sort of thing I am particularly bothered about, but the combination of perfect light and the recollection that I didn't have a shot of any class 20s at Evesham spurred me into action. It is quite likely that a repeat here won't be possible bearing in mind the imminent demise of the signalbox and associated semaphores, hence yet another trip to this well-used location. It's also a good spot to get a clear view of the consist of the train, which comprised 37412 , 37672 and de-branded 37029 with 4 PFA flats to provide brake force. The rather colourless ensemble, 6Z37, is here seen passing the lower quadrant inner home signal at Evesham running in the region of one hour late after losing some time both north and south of Birmingham and consequently missing its path onto the single track Cotswold Line. There was just time for a brisk walk and short jog around the corner to the other end of Evesham station for another shot as 6Z37 pulled away with a good dose of whistle and English Electric exhaust noise. The nuclear flask train was Bridgwater to Crewe have been running in recent weeks, usually with a combination of classes 20 and 37 in charge. 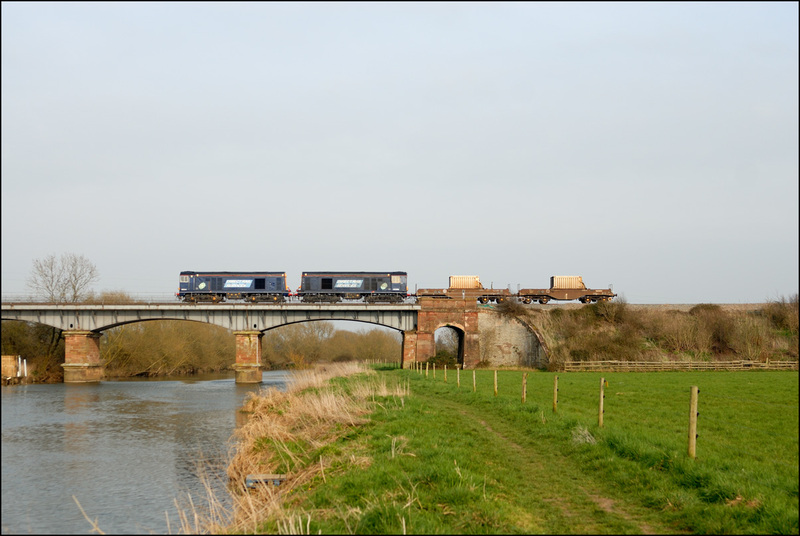 I don't often bother with these very short trains but the shot at Eckington Bridge is ideal for the length of them so here are 20314 + 20308 crossing the River Avon with 6M67. It was running very early, as is not uncommon, passing me at 15.36 after missing out the extended layover in Gloucester Yard. Class 20s were not all that common on the line through Leamington Spa in 1984, so it was with some pleasure that I took this photograph of 20166 on the trip either from Bescot or Nuneaton. The train ran only to Banbury as it returned a little over one hour later with a rake of mineral wagons. 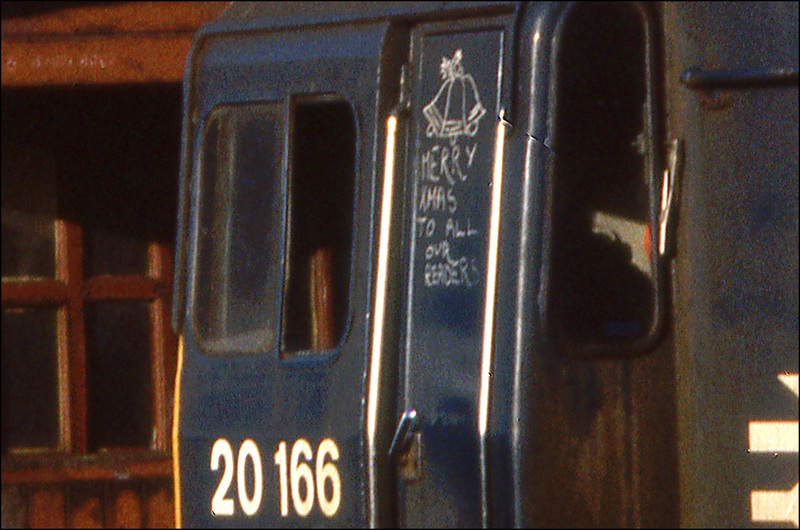 The date of the picture is 21 December 1984 and the cab door had this seasonal greeting chalked on it. 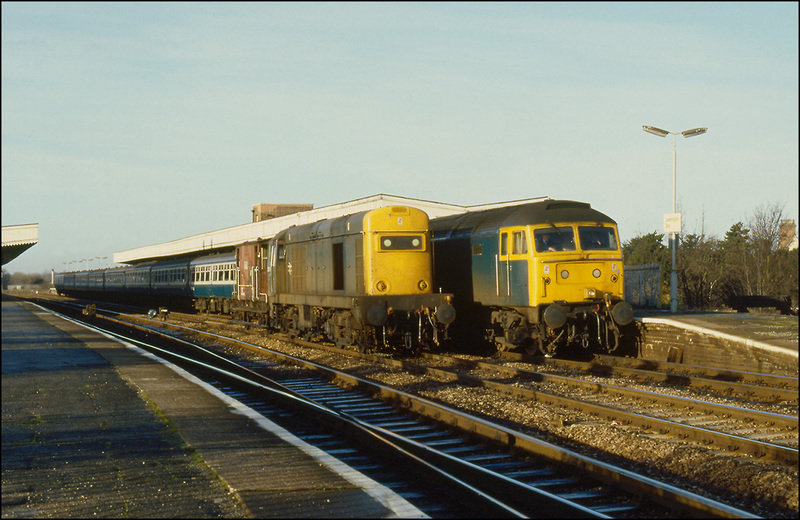 The locomotive and brake van were held in the centre road for some minutes until 47481 with the 06.45 York - Portsmouth Harbour had come and gone. About eighteen months after the picture above was taken, I photographed 20070 + 20026 thrashing through Leamington Spa with a Tyseley to Banbury road learning special. These trains ran quite frequently at this time and used just about motive that happened to be spare at the time. I saw 20s, 31s, 37s, 45s and 47s at various times and missed 40012 through being unable to take the time off at work at short notice. As far as I can remember, there were 3 or 4 return trips each day and the diagram seemed to be for 3 days at a time. The bracket visible above the cab of 20070 at one time held held a lower quadrant semaphore signal which controlled the up through road; the one on which this train is running. Returning to the Birmingham area, here is a picture of 20125 at Small Heath, Birmingham running on the up main line, it's destination being Tyseley. The scene here was changed not long after this photograph was taken by the construction of a filling station on the piece of land on the extreme right of the picture. Single 20s were not uncommon at this time, 5 March 1986, especially on relatively lightweight trains but what a great sight it makes with a brake van on the rear of the consist. Today a similar working would no doubt be vastly over-engined and hauled by a 66. 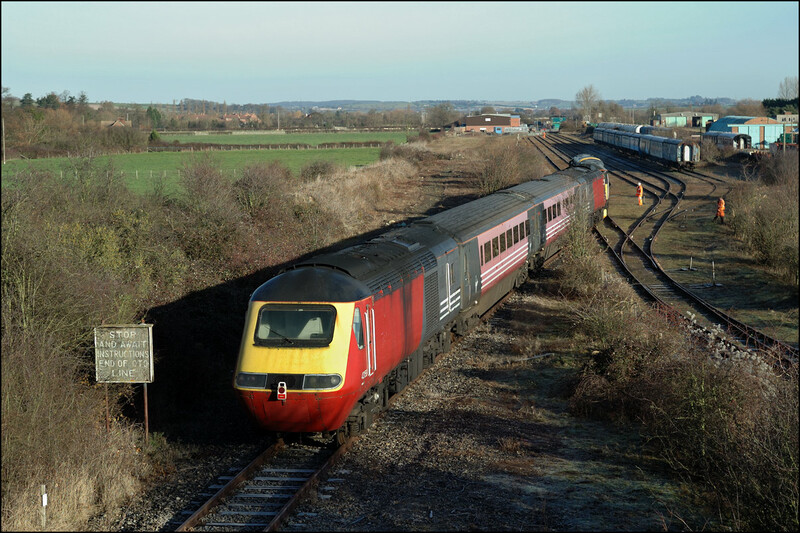 Saturday 17 December saw another move of stored Virgin HST stock to Long Marston. This time, the motive power was 20905+20096 - another first for the recently revitalised branch, although the weedkilling 20s did work here in May 1992. Today's train originated from Bicester on Friday 16 December and was staged overnight at Gloucester from where it left at 08.52 as 5Z22 . My first shot was taken at Ashchurch where, as I thought, the rising sun would just be high enough for a tastefully backlit shot at 09.08. The power cars are 43121 and 43158. After runnning-round at Worcester, 5Z22 headed up the Cotswold line to Honeybourne, where the branch to Long Marston was taken. 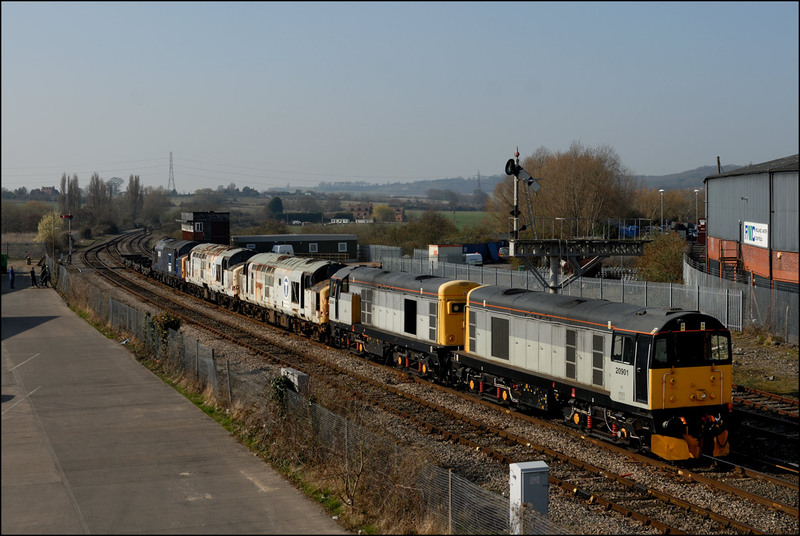 The pair of newly repainted HNRC class 20s is seen here approaching the yard in dappled sunshine at 10.45. Once authority to enter the yard had been given, 20905+20096 whistled their somewhat faded and pink HST stock into the exchange sidings from where 12081 will later move them to the storage area. The departure of 20096+20905 was slightly delayed while one of the operatives from the site fetched and fitted a point clip to the switch leading from the exchange sidings to the main line. This did not take long, and the locos are sen here leaving the site for the run back to Gloucester. 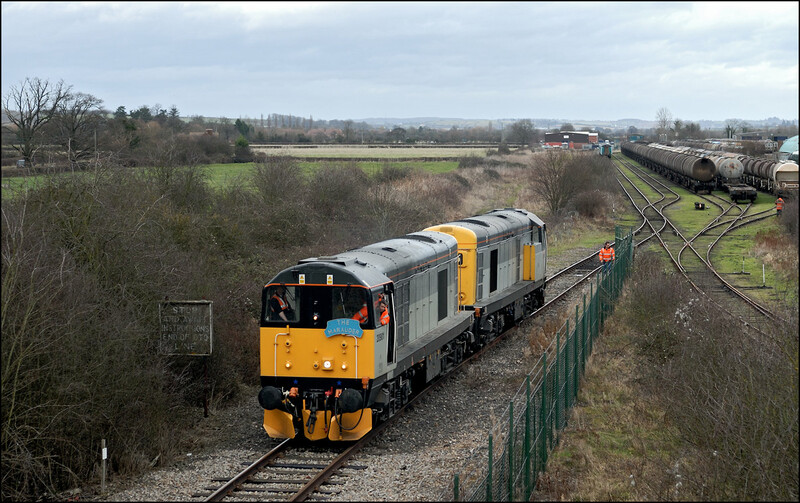 Bearing in mind the poor state of the track and the branch being low on Network Rail's priority list, I wouldn't be surprised to see these lighter locomotives used on trains to this location more regularly. The shunting locomotive, 12081 also from the HNRC fleet, can just be made out as it approached the newly-arrived stock in the sidings. 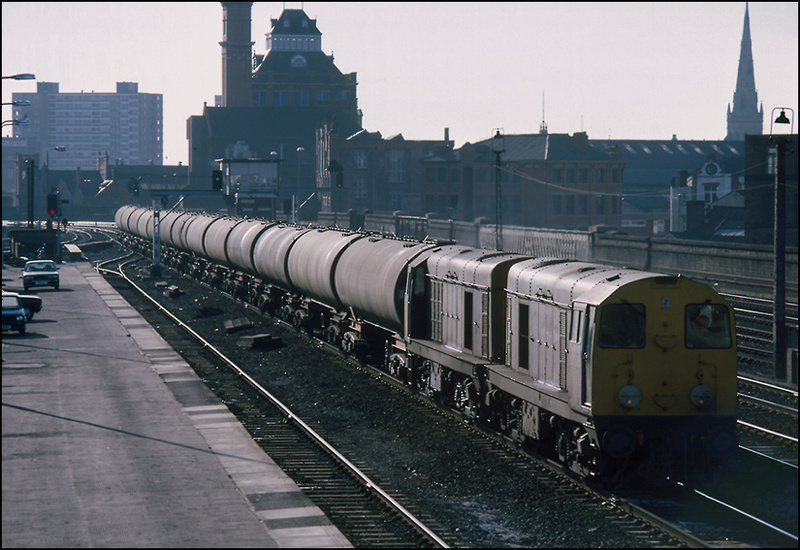 Heavy backlighting really shows the details of the train and locomotives at Manchester Exchange on 27 February 1986 as 20128+20006 head east with a train of empty oil tanks. I was told at the time that this was a Stanlow to Leeds working, but I have nothing to confirm this. 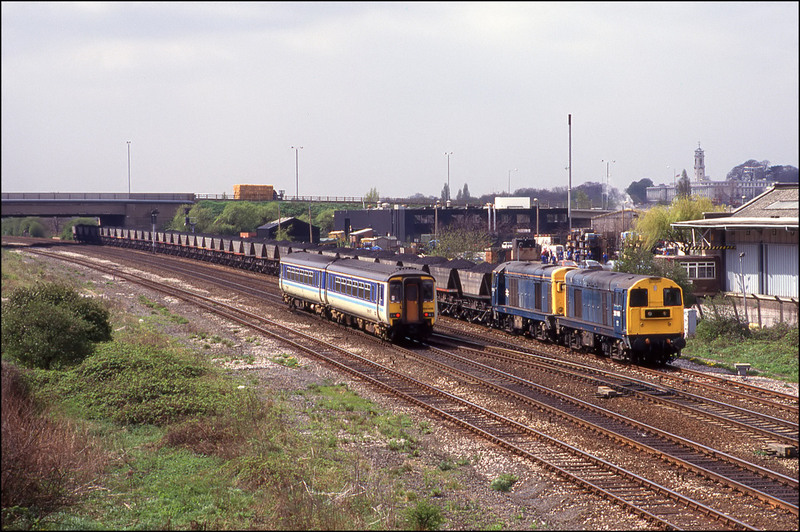 The Sutton Park line was very busy with freight in 1990 and a location I visited on several occasions. 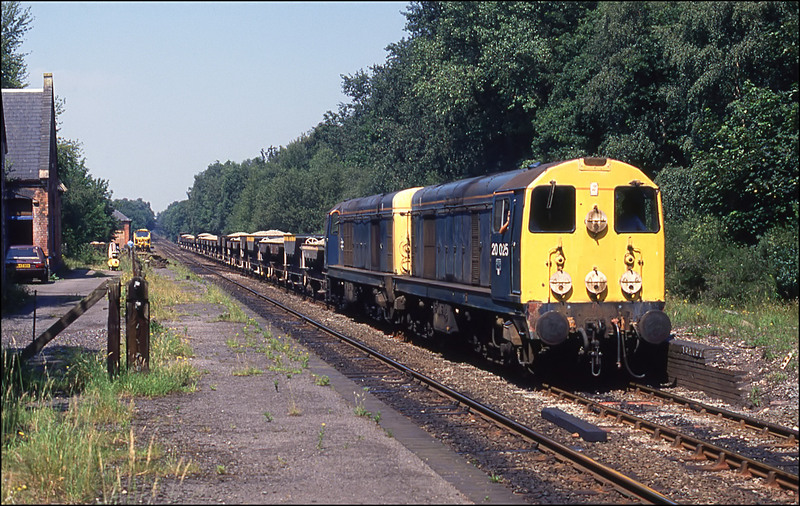 13 July of that year was beautifully sunny and I photographed 22 freights with 6 different class of loco, one class 47 hauled ECS and a couple of track machine movements in a little under 5 hours. 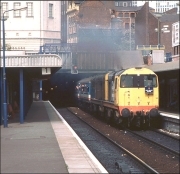 This picture shows 20025+20096 with an eastbound ballast train which had probably originated at Bescot. It was sometimes difficult to identify train movements on this line other than the freights listed in the WTT. Trip movements were frequent and were often running as "Y", meaning that the destination varied with traffic requirements. 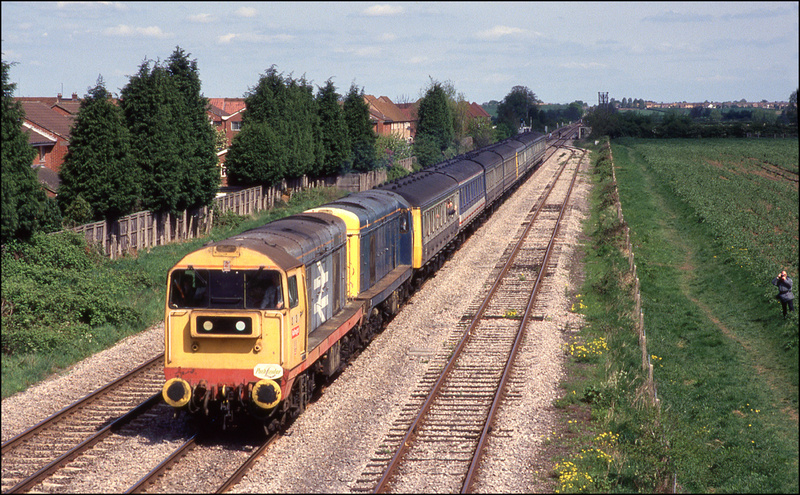 Moving to the other side of Birmingham and into the Black Country, here is a shot of 20151+20059 near Dudley Port on the Stourbridge Junction to Bescot freight line on a murky 17 May 1991. The train is the Round Oak to Boston empty steel and class 20s were about to finish on the working, to be replaced by 37s. The locos took the train to Round Oak early in the morning and were booked to return later to pick up the empties. On this occasion, they duly appeared heading south light engine, only to return some 20 minutes later, still with no train. About 35 minutes later they came back again, this time clearly going to Round Oak as they returned with the train. What was that all about? Had a crew member been left behind? For some reason best known only to me, I took this picture in vertical format which has resulted in the rather odd shape as I tried to crop it to fit this page. If you're viewing this on a small monitor then the proportions will be better if you right click on the picture to expand it. The next 2 shots shows class 20s on MGR duties around Nottingham. 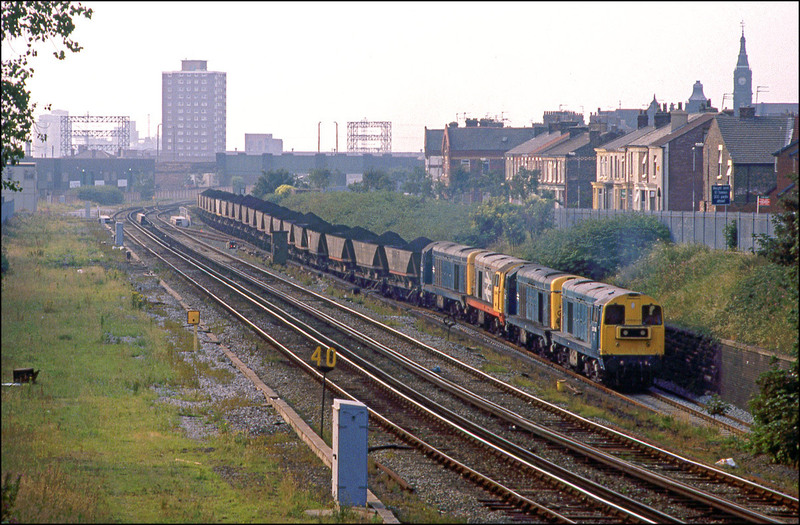 The class's work on these coal trains was drawing to an end around here by this time, mid-1991, as both Gedling Colliery and Staythorpe power station were about to close. The frst picture shows 20148+20185 approaching Nottingham station with a loaded MGR for Staythorpe on 16 April 1991. The 156 unit just managed to avoid being a total nuisance! 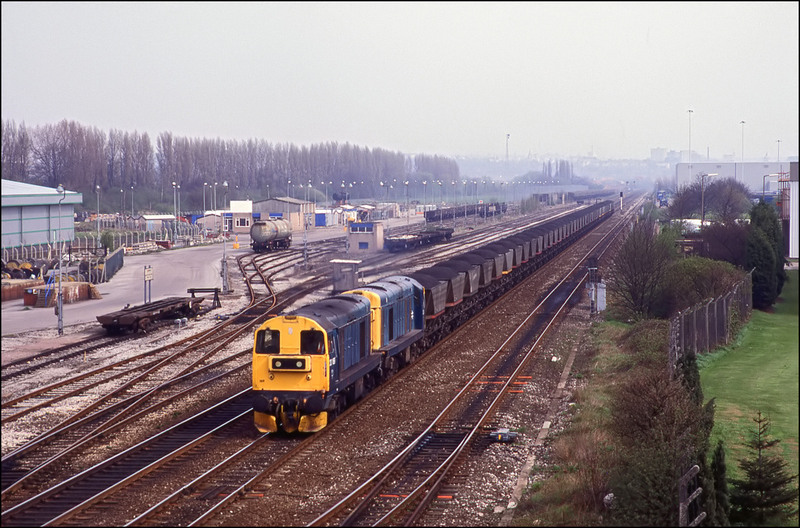 The second view is a little further west at Beeston and depicts 20169+20210 passing the former freightliner depot on 10 April 1991. 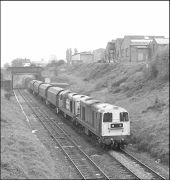 This train would have originated at Gedling colliery and was destined for one of the Trent Valley power stations. 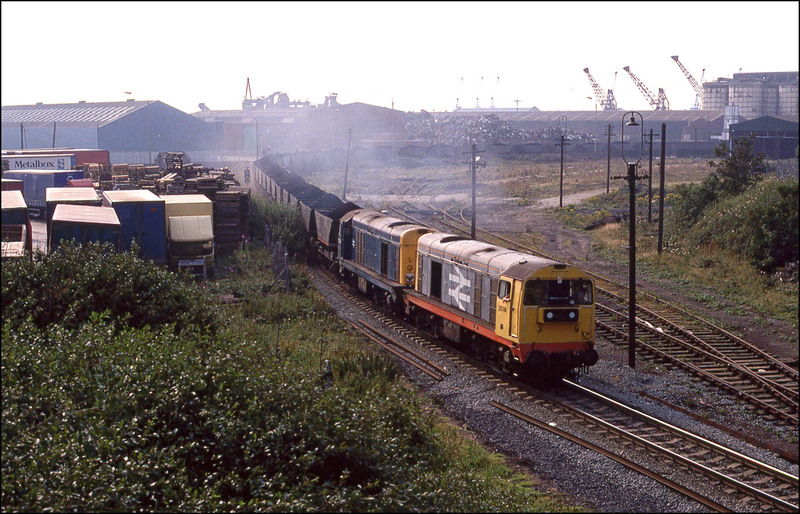 These shots are the result of a trip to Liverpool Docks on 24 July 1990. 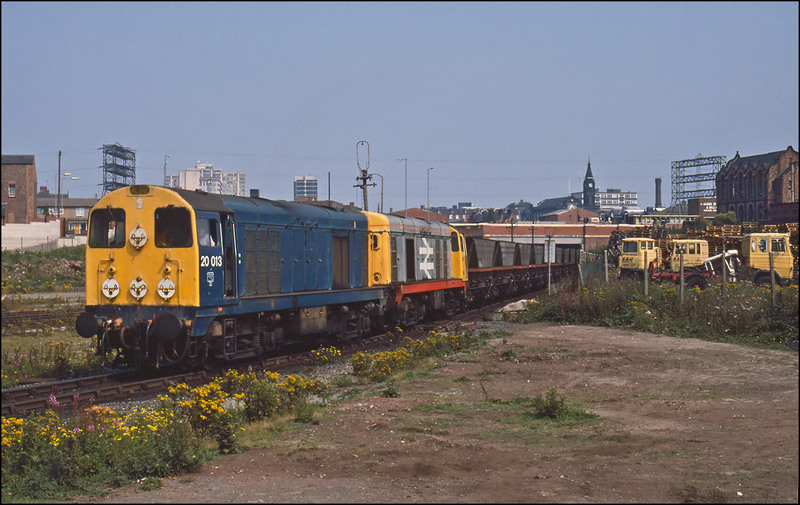 Class 20s were shortly to finish working the MGRs from the docks to Fidlers Ferry power station and indeed, on this day 56025+56026 made an exploratory light engine trip down the branch. The first shot shows 20013+20141 running through a long abandoned yard with the empty HAAs before crossing and then running alongside a public road before entering the docks and being loaded with imported coal. The next shot shows the train some 2 hours later returning through the yard, this time pictured from the adjacent road bridge. I must admit that I am very partial to this type of industrial scenery and it is a matter of great regret that locations such as this are now so few and far between. The amount of work being performed by the locos can be judged by the exhaust shown up so well by the backlighting evident at this time of day. Unfortunately, all this effort was to no avail and the train stalled on the climb towards Bank Hall station. From the bridge at this location, occasional bursts of power could be heard but no movement resulted. After a wait of nearly 2 hours another pair of locos appeared, coupled up and with a huge racket got everything moving. By this time the light had all but caved in, but there was no way this shot was going to be missed! 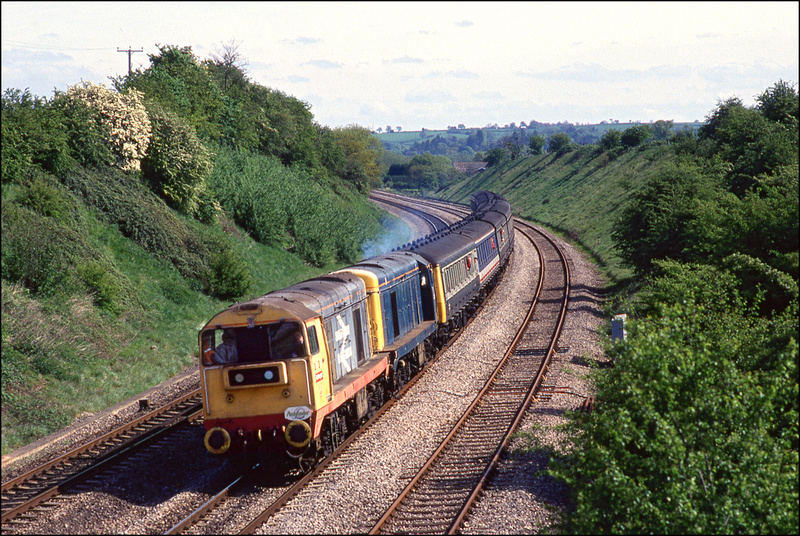 Another railtour took 20081+20016 from Sheffield to Bristol on 27 April 1991. The train, chartered by the Class 20 Society and runnning as 1Z40 (20+20? ), is seen passing the clutter of the coal yard adjacent to Droitwich station at 11.43 having run via Bromsgrove and the single line curve from Stoke Works Junction. This yard, previously rail-connected, has gradually become more of an eyesore as the years have passed and is now, of course, protected from the railway by pallisade fencing. There are no fewer than 9 lower quadrant semaphore signal arms visible in this picture and this is still the case in 2005. There are not many locations of which this can be said. 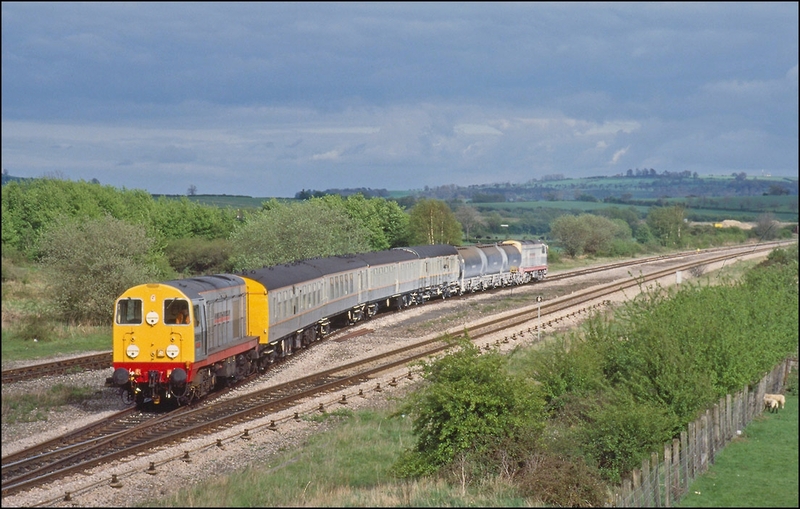 The most likely train in which to find class 20s in the Midlands is currently one of the DRS nuclear flask workings from either Bridgwater or Berkeley. 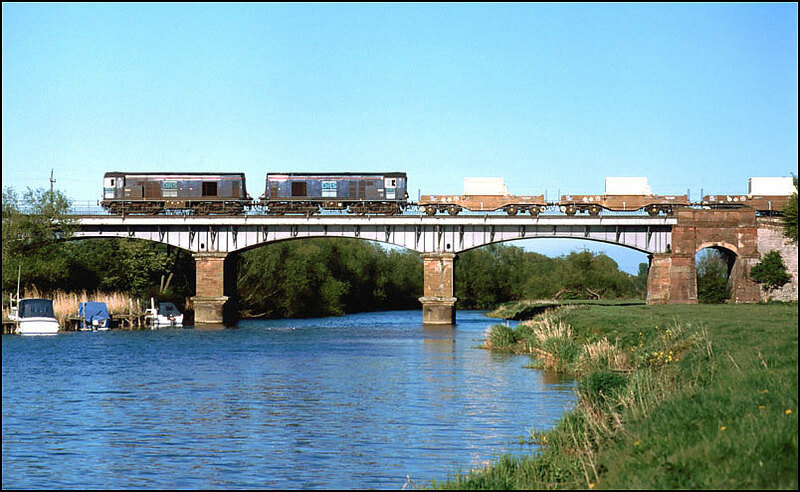 This picture shows 20307+20308 crossing the Warwickshire Avon at Eckington Bridge with the former on the beautiful evening of 24 April 2002. The train had been looped just south of here and was therefore thrashing quite well at this point. I believe that this was the first working of this train to run without barrier wagons. Class 20s were for many years associated with MGR traffic to Ironbridge Power Station situated at the end of a branch from Madeley Junction on the Wolverhampton to Shrewsbury line. By January 1991 appearances were becoming rarer as 58s took over the traffic. 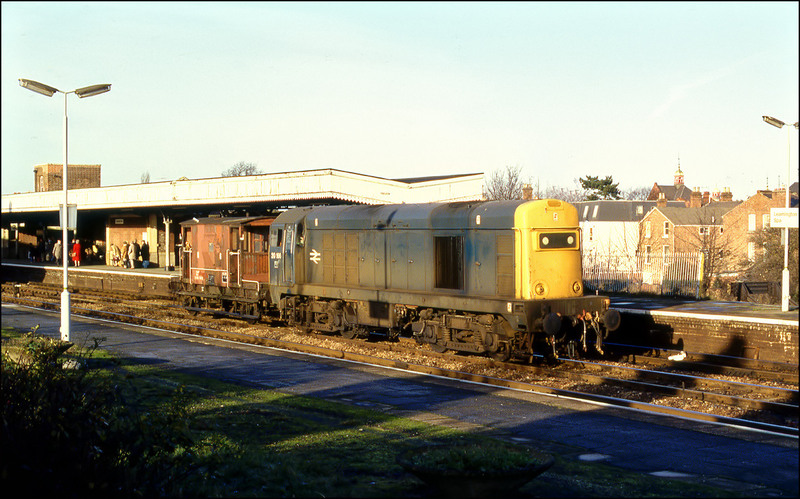 This picture, taken at 15.11 on 4 January 1991 and thus just catching the last of the sun, shows 20021+20132 storming on full power through Cosford station having been checked at the outer home signal. 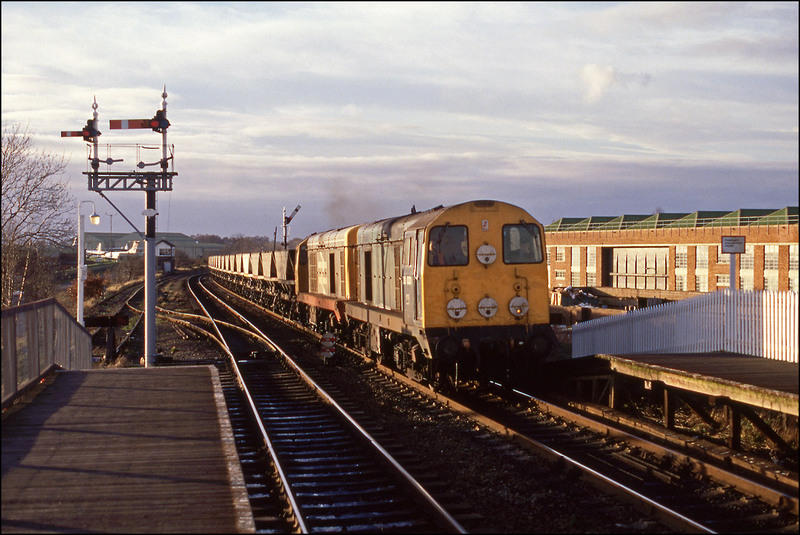 With few booked passenger workings, class 20s have always been popular traction for railtours. The "Stilton and Branston Ploughman" run on 5 July 1987 was no exception and I was especially pleased because it gave the chance to photograph a locomotive-hauled train on the normally DMU only North Warwickshire line. It was also the first time I had recorded 20s, 20022+20126, on this line. The spot selected was a rural view just south of Wood End tunnel. The train was late and with the sun going in and out the wait was a little fraught. However, when the special finally appeared the sun, although not at full strength, was not at all bad. 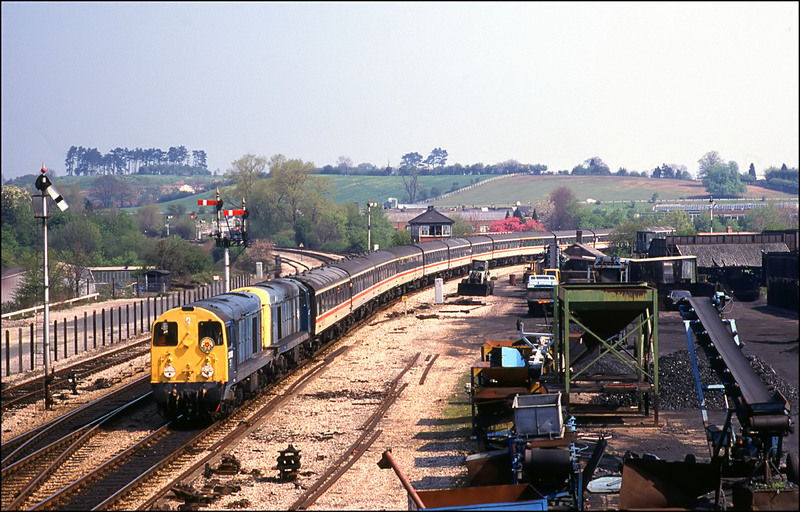 After visiting Stratford-upon-Avon the train returned north via Bearley Junction, where it is pictured below with some happy-looking bashers visible, then on the single line to Claverdon and Hatton North Curve - more very rare line for loco haulage. 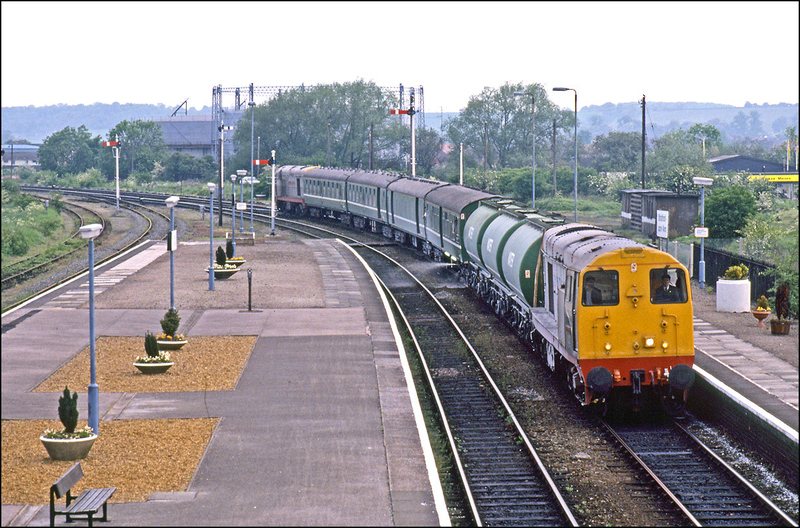 Moving into Stratford-upon-Avon itself, this photograph shows 20903+20902 bringing the weedkiller into the station just before 07.00 on a dull 25 May 1991. This train was the first use of the Hunslet Barclay "killer 20s" here, previous years' having been hauled by either a 47 or 31. 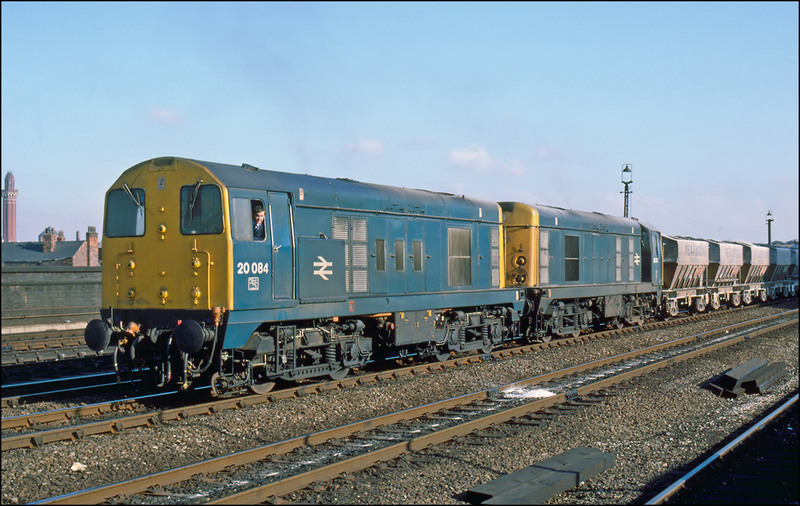 MPVs now work this train - we have sadly missed out on the class 37 hauled version so popular elsewhere. The scene at Stratford has dramatically changed since the date of this picture. The semaphore signals and the siding on the extreme left of the picture have gone, the station now being remotely controlled from Bearley Junction and the signal box was removed - along with my main source of "gen" at the time! The gasholders, for so long a feature of this part of the town have also been demolished. 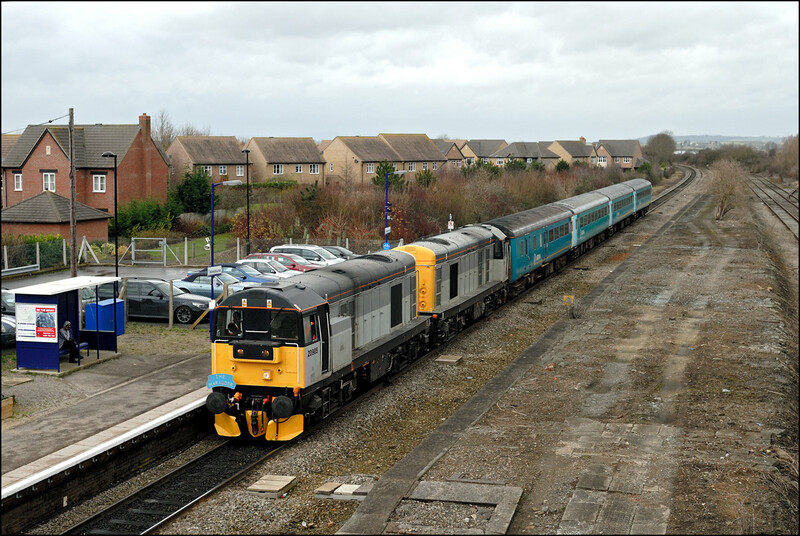 A pair of the HNRC class 20s saw some activity on Tuesday 8 January 2008 when 20905 + 20901 took 4 Arriva-liveried coaches from Crewe to Long Marston. The train was booked to run on either the 7th or 8th and the weather forecast for the latter was for heavy rain in the Midlands. This fortunately didn't materialise, although a 40 minute late start from Crewe threatened to put a dampener on the proceedings because of the few available paths along the Cotswold Line from Norton Junction to Honeybourne. In the event 5Z90 was diverted from its booked route via Walsall and Sutton Park and ran via the much quicker and shorter route through Bescot to New Street and thence back on route at Kings Norton. This allowed for its original path from Worcester and it did, in fact, manage to run a few minutes early. In view of the amount of cloud I decided to go to Honeybourne where a decently wide shot can be had to show off the contrast between the locomotives and stock and here is 5Z90 arriving in the platform much to the bemusement of the solitary passenger waiting for his train south! It doesn't usually take long to drive from Honeybourne to Long Marston and I arrived in plenty of time to set myself up for my usual arrival shot. I'm sort of surprised that this shot is sharp because the wind was blowing an absolute gale into my face at this exposed location and it took some effort to hold the camera steady. The light grey livery of the 20s is a distinct advantage on a dull day as it shows up much better than EWS maroon or the dark green of some class 47s. It was good to see something different appear in the distance and then to hear the whistling as 5Z90 came into earshot. The sun briefly appeared just as the gate to the site at Long Marston was opened and the train moved into the exchange sidings. 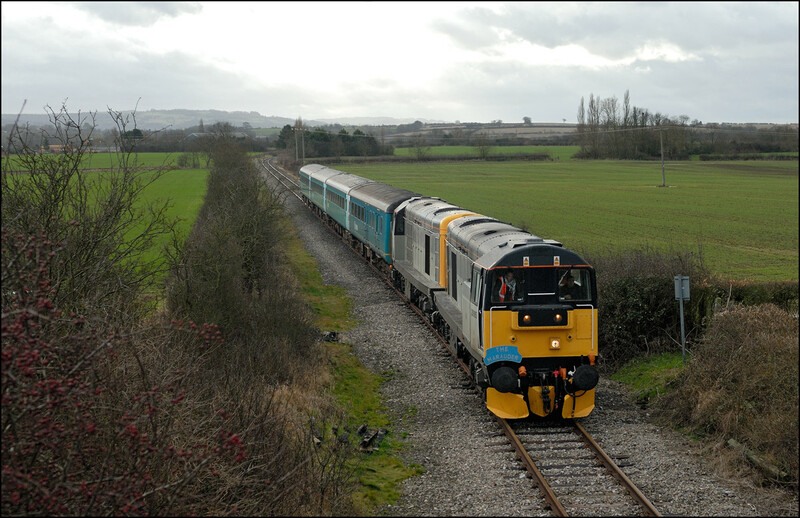 Very little time was wasted in uncoupling the locomotives from the Arriva stock and 20901 + 20905 soon came back onto the branch and made a lovely sound as they accelerated away light engine towards Honeybourne, Evesham and Bristol Temple Meads. 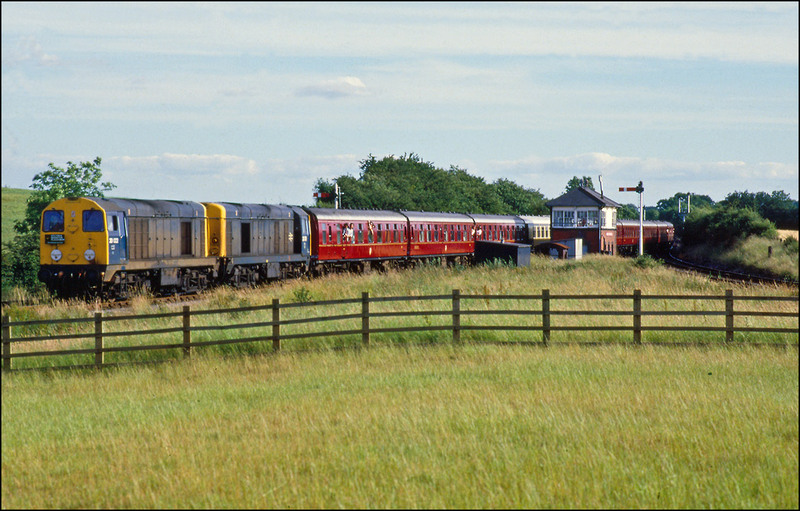 Over the course of a year one or two railtours start from Stratford-upon-Avon. 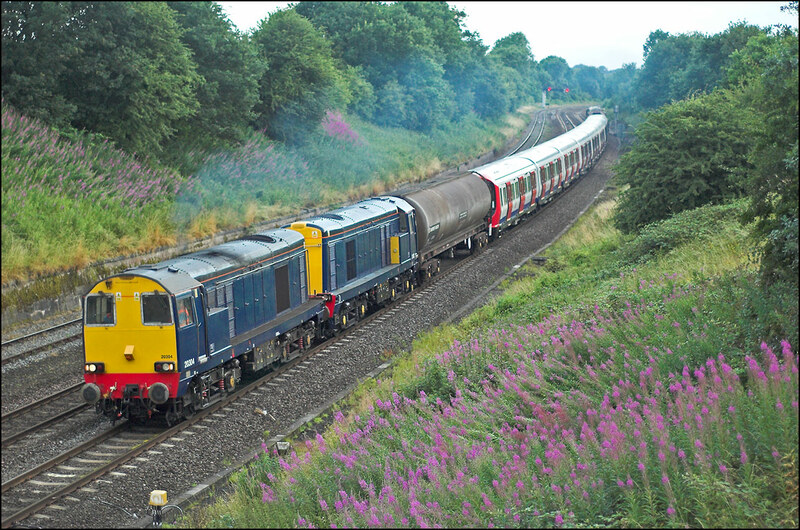 On 7 July 2012 Cheshire Cat Railtours in association with Pathfinder ran such a train going to Carlisle with DRS providing the motive power in the form of 20308 + 20309, the first visit of the company's class 20 to the town. 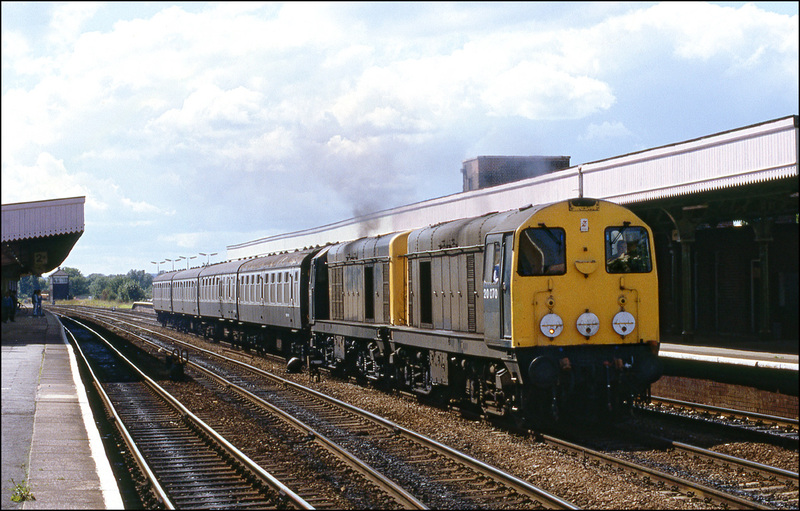 The last time class 20s reached Stratford was on 23 May 1991 when 20903 + 20902 arrived with a weedkilling train. I wanted a record shot in order to keep my pictures uo-to-date but with the ECS, 5Z19, scheduled to arrive in the terminus at 05.11 thought that it was a bit too early. As it happened, I woke up at about 04.40 so decided to have a try for a shot. Here then, is 5Z19 pulling into platform 2 at 05.03 in virtual darkness and showing the benefit of modern digital photographic equipment. There is a locomotive release loop on the south side of Stratford station and the 20s were soon uncoupled and ran through platform 1 before being put onto the stock ready for departure. The departure time for 1Z20 was 06.11 so with about forty five minutes to kill I went home for a short time. I live reasonably close to the railway and from my drive could hear 20308 + 20309 whistling away in the quiet of the early morning. As the light was never going to reach better than abyssmal I had no intention of making too effort and went to the roadbridge at Claverdon station. The obvious place would have been Hatton North Junction but in such poor light the ten or twelve minute walk seemed a waste of time. It was just before 06.20 when 1Z20 with 20308 leading came into view before passing through the single line platform at Claverdon. A similar train from Stratford-upon-Avon ran to Edinburgh at the end of June last year with 67001 in charge, albeit in slightly better weather. The third and final train that I photographed at Bentley Heath on 19 April 2013 was a transit move of two newly painted class 20s, 20227 + 20189, from Butterly MRC to West Ruislip. I very rarely bother with light engine moves and certainly wouldn't go out if there were nothing else around but the novelty paint schemes carried by these locomotives made it worthwhile. These are two of the 20s used to move new tube stock around hence the decision to paint them into liveries reflecting London Transport practice over the years. Unusually for such a move there were virtually no reports of 0Z20's progress so it was very much a matter of waiting for them to turn up. I chose this location, leaning on a gate by the level crossing, because it gave a decent close view as the train ran slowly past before going into Dorridge Up Loop to allow a couple of passengers trains to pass. The sun had co-operated for the two freights that I had photographed but managed to be behind a thick black cloud for this one. The frequent trains of "S" stock from Derby to Amersham are well known and must have been photographed at every possible location. Less well covered are the northbound trains of stock going back to Derby for modification and this relative rarity made the train, 7X10, during the early morning of 9 May 2013 a more interesting proposition for me. It was due to pass Hatton just before 07.00 and ran close to time throughout its route and I arrived on the footbridge at the southern end of Hatton cutting just as it was passing Leaminton Spa. It has been some years since my last morning visit here and there was rather more shadow on the track than I had envisaged, but, with my late arrival, there was no time to move somewhere else. I heard the distinctive sound of 20311 + 20314 climbing Hatton bank long before the train came into sight but the sound died away and is was obvious that it was to be stopped at the signal, just visible at the back of the train, which is usually used to show that trains are being routed in to the down goods loop. I knew that 7X10 wouldn't be looped but wondered why it had been halted as the previous train had been gone for at least fifteen minutes. Two passenger trains came south before the signal was cleared and the tube stock came forward in a cloud of exhaust smoke and accompanying noise so I assume that the coaches are sufficiently out-of-gauge to require both lines through the curved platforms of Hatton station to be clear. The two GBRf class 20s 20901 + 20905 were dead on the rear of the consist as it climbed away in much better lighting conditions. I wasn't expecting to go out for any photographs on Wednesday 31 July 2013 because 1) the weather forecast was dreadful and 2) I had a long-standing commitment over lunchtime. I knew that 20142 + 20189 were going light engine from Gloucester to Long Marston but without knowing any return times I had already decided that there wouldn't be enough time to record this unusual working. However, the schedule for 6Z21 to Doncaster appeared and it appeared to just give me time for at least one photograph at Long Marston and with a bit of luck and early running another couple along the branch to Honeybourne. On arrival on the roadbridge at Long Marston the distinctive whistling sound of the 20s was clearly audible and it soon became obvious that departure was imminent. 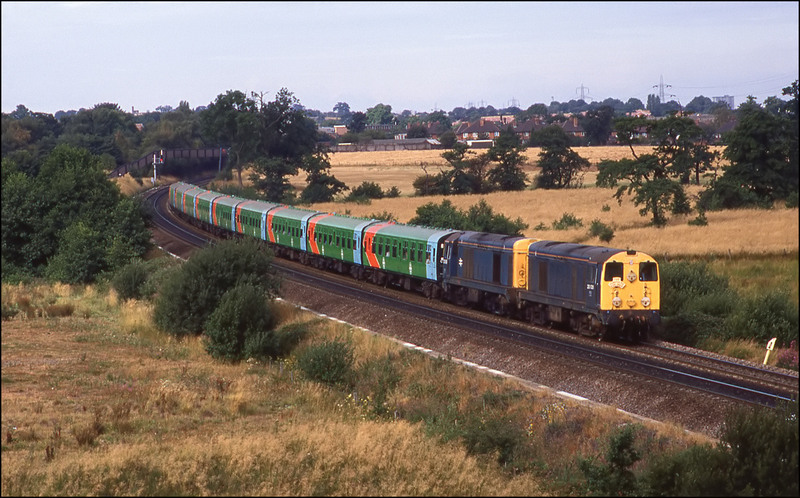 The train moved out of the exchange sidings within a few moments and this colourful shot was taken as the five JNAs, the same as those taken in here by 66702 on 29 July, were taken onto the branch. It was still eleven minutes before the scheduled departure time of 20142 + 20189 from Long Marston as I headed off to Honeybourne for another look at 6Z21. There wasn't much of a wait before the short train appeared and after a minute or so standing at the staff hut to replace the single line token moved towards the station where a red light protected the junction with the main line as a green aspect was showing for the down main. The light was still dreadful but who cares when such a rare locomotive combination is on the cards? The vegetation in the space between the branch and main lines has really grown up over the past few weeks but there was still enough of an angle for a reasonable shot. The green signal for the down main line at Honeybourne that I mentioned above was for a train not stopping at the station which meant I had to have a quick run along the various ramps of the footbridge to try for a final shot of 6Z21. I just had time for this image as it began to move, grabbed by leaning over the fence, which fortunately is of reaonable height and not spiky, on the up platform. The weather hadn't been quite as bad as forecast as at least the threatened heavy rain didn't materialise and just as importantly, I made my lunch with at least seven minutes in hand! I don't often bother with photographing light engine moves even if one passes by when I waiting for something else but this one on 25 February 2014 was colourful enough to be worthwhile consisting as it did of 20189 + 20142 towing 47375, 31459 and 47769 which the class 20s had collected from Okehampton and were taking to Derby. The train was close to right time when it entered Eckington loop which is situated a little way to the south of the roadbridge at Defford in Worcestershire from which I took this shot. As expected, it was released from the loop well before its booked time and the early running continued all the way to Derby. I wanted somewhere with a reasonably wide view and nice background and could think of few places better without going too far. The sun came out of some very thick cloud and the resultant backlighting, unavoidable anywhere along this line during the early and mid-afternoon, shows some detail of the locomotives to good effect. The weekly train of tube stock from Amersham to Derby, 7X10, ran into difficulties with braking problems on the approaches to Princes Risborough on Tuesday 11 March 2014. It eventually moved from the down through road there at 10.17, some 301 minutes late. This meant that a rare daylight shot of it between Leamington Spa and Birmingham was on the cards although finding an even half-decent location on that line at around midday is far from easy. The three arch bridge at Hatton was no good as the line was shadowed; the formerly open shots between that bridge and the footbridge at the south end of Hatton cutting were hopelessly overgrown which left just the footbridge itself. Although it's a poor location with hardly any background it had to do and here are 20901 + 20905 leading the stock with 20096 + 20197 bringing up the rear. 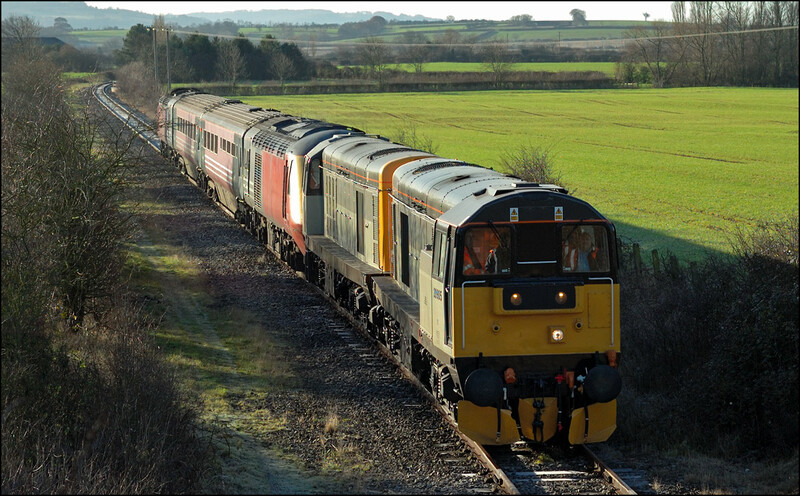 DCR has just arranged with GBRf to hire 2 of the company's class 20 locomotives, 20142 + 20189. 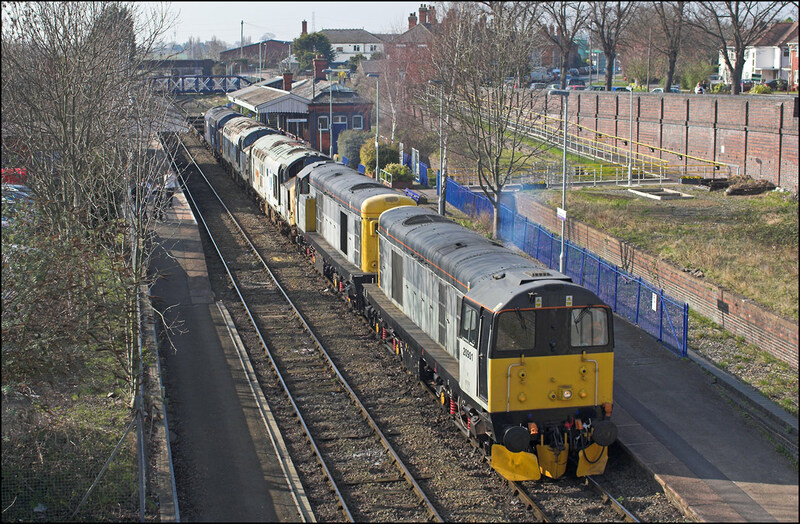 These were used during the afternoon of 31 March 2014 to top and tail a new Railvac from Chaddesden Sidings to Willesden Euroterminal. It wasn't quite clear earlier in the day, despite the headcode 6Z20, whether the 20s or 56312 had been allocated but it turned out that the 2 20s were indeed to be used. I wouldn't have bothered if 56312 had been in charge but the relative novelty of the multi-coloured pair was more attractive and so, after the funeral for which I was playing the organ, went to the nearest location for me, the roadbridge at Hatton station. The sun had earlier tried to come out but naturally enough was firmly fixed behind thick cloud when the short formation rolled past as it had been a few minutes earlier when 70019 had gone south with 4O09, the 10.08 Trafford Park to Southampton freightliner. I had hoped that some PNA wagons would be included in the consist but had to make do with this very short formation. The early morning of Saturday 3 May 2014 saw an unusual working of 7X10, the 02.20 Amersham to Derby train of tube stock. As the weather forecast was for clear skies from dawn I thought that a trip out to Bentley Heath footbridge might produce a worthwhile result. I normally visit this location only during the late afternoon but hoped that the sun would just about be high enough when the train was scheduled to pass at 07.07. I arrived about 15 minutes before 7X10 was due and saw from RealTime Trains that it had passed Hatton only 1 minute early and at the same time saw a post from a friend filming the train there that Railfreight liveried 20118 + 20132 were in charge. The booked run through platform 2 at Dorridge station took place and here is the colourful consist snaking across the pointwork as it exited the loop. The locomotives were being worked hard at this point and the different sound to the usual trains found here quite possibly woke up a few residents of the adjacent houses. Trains of tube stock for modifications returning to Derby from Amersham recommenced on Friday 1 July 2016. For some reason I can very rarely be bothered to go out for the southbound workings of new stock, 7X09, which are perfectly photographable during the Spring and Summer but the northbound trains seem to have more interest; possibly because few others go out for them. For the first run of this tranche of trains HNRC's 20314 and BR blue 20107 led 7X10 which left Fenny Compton loop 13 minutes early; the cue for me to start the 15 minute drive to Hatton where I wanted to take an image of the train passing the platforms and still almost deserted car park. The early running was an advantage as it lessened the chances of a southbound passenger train getting in the way. My picture shows them approaching the summit of Hatton Bank around 7 minutes early at 06.48 having lost a few minutes through following a class 172 on 2V06 from Leamington Spa to Worcester. On occasions this train has run very late which gave other opportunities such as on 3 December 2013 when a mid-morning run led by 20314 + 311 took place which I shot at Hatton North Junction. One or two also ran early on Saturday morning such as this one on 3 May 2014 which I photographed leaving the down loop at Dorridge with 20188 + 20132 in charge. 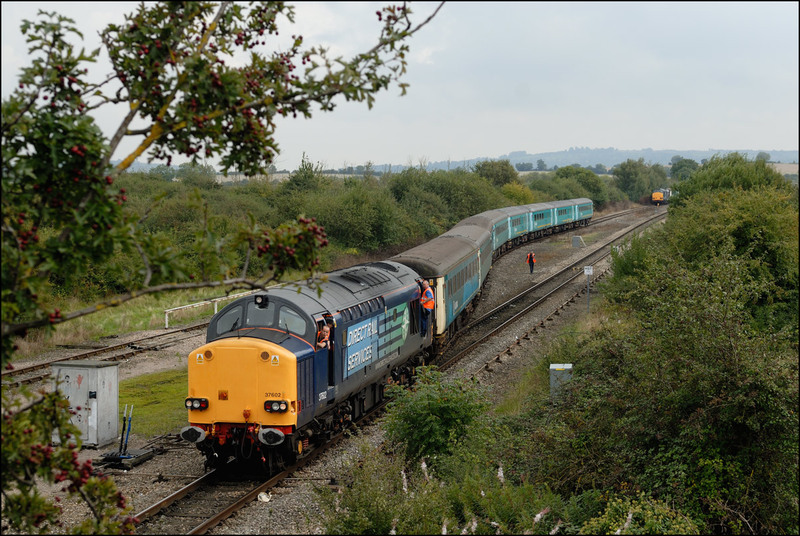 GB Railfreight is running one of its 4 day railtours in September 2016, commencing at Eastleigh, and marking the 15th year of its involvement in the rail industry in the UK. 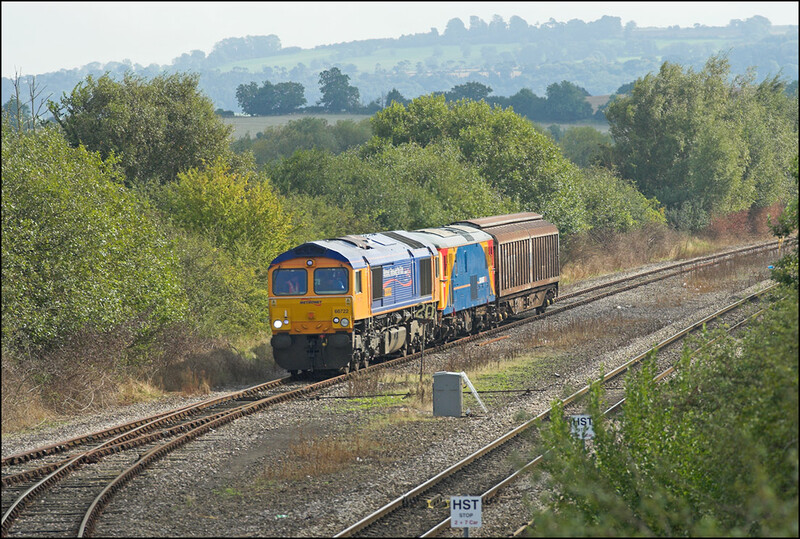 The empty stock for the train was taken from Wetmore Sidings, Burton-on-Trent, on 7 September 2016 the traction being provided by red-stripe Railfreight class 20 locomotives 20132 + 20118. I decided to go to Bentley Heath Crossing footbridge for 2 reasons, 1) to be able to see the full length of the train and 2) to hopefully avoid the shot being obscured by a long and quite slow-moving 4M28 from Southampton which was due to pass Hatton very close to the booked time of 5Z15. In the event 5Z15 was 12 minutes late approaching Bentley Heath and 4M28 on time making the chances of something annoying happening much more likely here than at Hatton. Here are 20132 + 20118 (insert hyperbolic adjective here...) away from a signal check at the colour light behind the 4th coach just in time to avoid 66538 with 4M28 which was just approaching Dorridge station from the south. During the evening of 15 May 2017 a friend messaged me to say that ROG's 20205 + 20189 were to take a 6X64 from Leicester LIP to Long Marston. I didn't know what the consist would be but assumed that it would be a railvac. 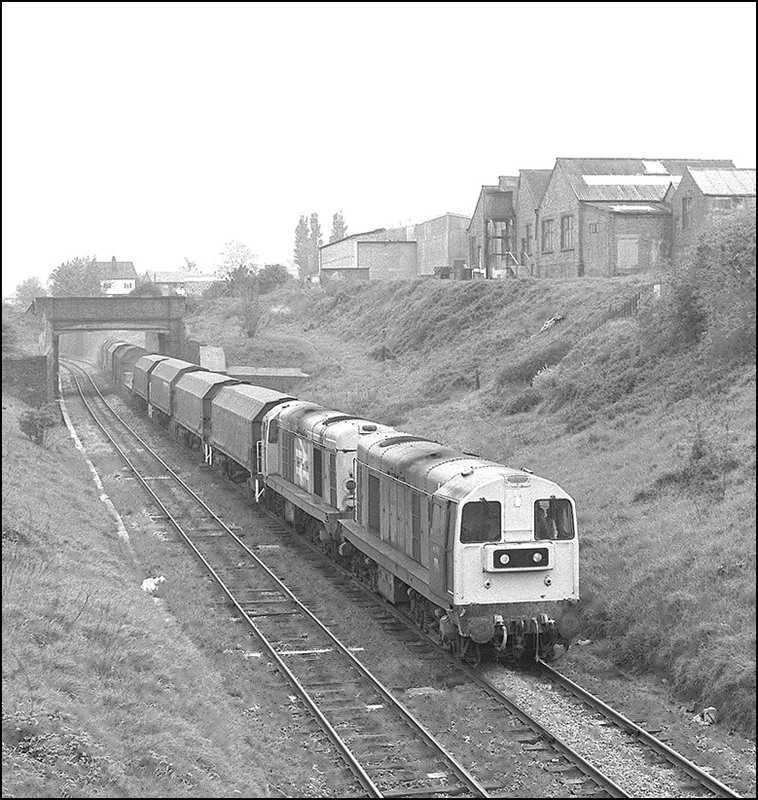 The train was routed via Derby and ran reasonably close to time until it reached Stoke Works Junction near Bromsgrove when some 30 minutes earliness was achieved although it was unlikely that this would continue all the way to Long Marston because of the need to wait for the single line between Evesham West Junction and Norton Junction to be free. In the event 6X64 left Worcester about 15 minutes early and stuck to this until arrival at its destination. RealTime Trains has recently had some issues with VSTPs but a bit of digging found an alternative source of live running details so I was able to leave home at a reasonable time without the need for a lot of hanging about. I went only to Long Marston because 1) the weather was dreadful with light rain beginning to fall and 2) such a short train doesn't inspire me to travel far. I believe that there's some sort of gala at the Severn Valley Railway during the coming weekend although as I have no interest in preserved lines I don't know any details, but this pair of 20s was due to go there after leaving Long Marston so I guess that they are due to make an appearance. There were 2 trains in my area involving heritage old locomotives on Monday 14 August 2017. The first was a 6Z20 move of the barrier tanks used for LUL stock moves between Derby and West Ruislip and Amersham, the barriers being required for a northbound run. I initally thought that the train was cancelled but it was just that the locomotives were late in arriving at Derby. A resulting late start, some 95 minutes, was made but with plenty of recovery time in a couple of loops, especially that at Dorridge, not being required the train was only 31 minutes at Hatton. I rarely see with the stock moves as I simply can't be bothered to turn out at 8pm on the occasions it runs but I thought that an easy morning run would be worth a trip. The leading locomotives were 20905 + 20096 with 20311 + 20314 trailing the light load. The weather was dull and slightly wet but the multi-coloured motive power still look attractive as 6Z20 approach Hatton station. The up line is sorely in need of a visit from a weedkiller as there is a good crop of growth in the four foot.